As we learned earlier, fruits that have been cultivated in a soil that has been saturated with chemical fertilizers and pesticides have little taste or flavor. But fruits that have been grown naturally in soils that have not been chemically adulterated are charged with colloidal minerals, the very basis of life and of a healthy human body. 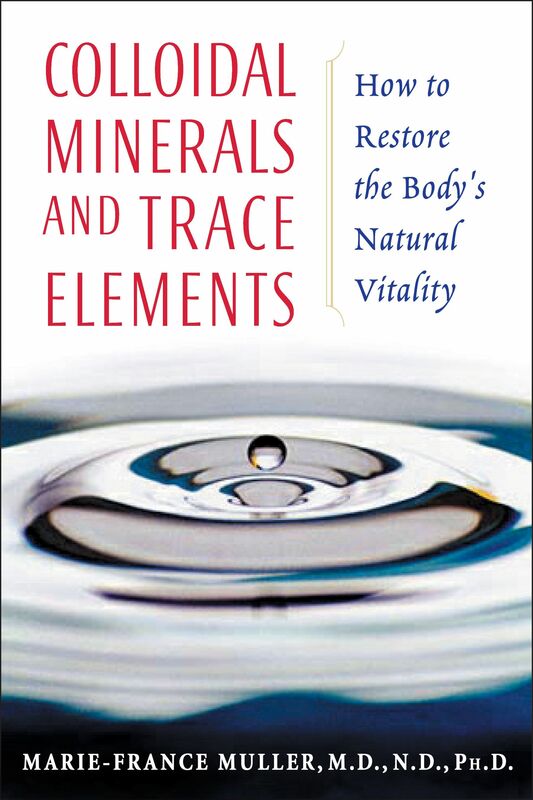 When the balance of colloidal minerals in the body is distorted, changed, or broken, minerals and trace elements are no longer pulled into the cells in the proper fashion. Instead they are deposited in the bones, nerves, and muscles, causing a kind of “scaling” that hardens the joints as well as nerves and muscles. These deposits are the source of various arthritic disorders, are a frequent cause of pain in the back and cervical regions, and are responsible for stiffness in the limbs and joints. Minerals are indispensable to life in all its forms. Limiting, say, calcium and magnesium intake to the amount in daily supplements is quite insufficient for the body’s needs. This is also true of iron, which is generally given as a supplement for women and children suffering from anemia. It is too often forgotten that when taken in its most commonly available medicinal form (which is nonorganic), iron can contribute to compromise of the body’s hepatic functions. What our bodies--and all living organisms--truly need is a very large cocktail of all the constituent minerals of our planet. These 92 elements are grouped together in the Periodic Table of Elements, also known as Mendelev’s Periodic Chart. Based on the most current research available in this field, to maintain good health our bodies require the regular daily intake of at least 103 different nutrients: 72 minerals, 16 vitamins, 12 amino acids, and 3 essential fatty acids. Unfortunately it has become almost impossible to take in all of these just from the foods we eat. --Some are involved in exchanges on the membranous level, the transmission of nerve impulses, and the supply of building elements to the bones. --Some play a role in balancing the other elements—essential to maintaining a healthy immune system. --Some form complexes with biological molecules according to an outline determined by the nature of the mineral or trace element, thereby enabling energy to adapt to a particular activity. --Some facilitate specific biological processes by exchanging energy through the exchange of electrons. It is easy to see that every element we take in is necessary and that the body cannot make do without any one of them or substitute one for another when a deficiency occurs. Not only is the presence of these minerals indispensable, but they also must be present in the necessary concentrations. --As transport elements they are affixed to proteins that deposit them in the tissues where they will either be used, stored, or eliminated. --As integral parts of proteins they can act as enzymatic cofactors or give proteins and nucleic acids their form. For example, we know of 200 enzymes that contain zinc, 4 that contain molybdenum, and more than 400 that contain magnesium. Minerals play an essential role in the synthesis of DNA, the process of the replication and duplication of cellular structures. In fact, the constant replacement of worn-out cells with new ones is entirely dependent upon trace elements. It is the body that determines what function a new cell will assume. The DNA molecule then programs it by providing it with genetic information in a way that ensures its proper functioning. When a cell has not been programmed well because of a deficiency of essential nutrients, it will simply continue to exist without fulfilling its proper role; the cell is alive but simply does not know what to do. The ramifications of this are not great when only a few isolated, improperly functioning cells are scattered here and there, but when they accumulate in a specific location they may eventually form a tumor that could become cancerous. Or, when our bodies are no longer capable of consistently producing healthy cells, we may age prematurely or develop a number of diseases that could cause us to die before our time. It is also the responsibility of minerals to regularize our metabolism and maintain a balanced blood pH through their alkalinizing qualities, which serve to buffer acids. As a general rule, our blood pH should remain slightly alkaline--between 7.35 and 7.45 on the pH scale. We should recall that on the pH scale acidity is indicated by readings lower than 7 and alkalinity by those higher than 7. Outside of this ideal zone, at a highly acidic internal cellular environment of 6.8 or in extreme alkalosis at 8, our bodies no longer function optimally and our health deteriorates. If these limits are breached, the body experiences a metabolic breakdown that could lead to death.